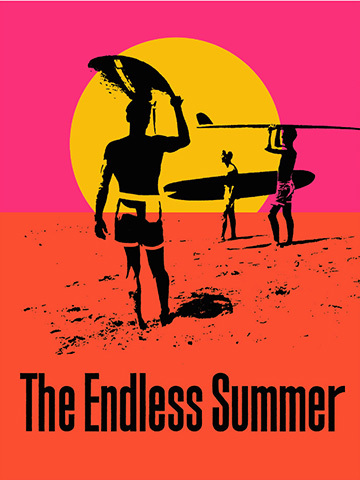 Everyone has seen it, the movie poster for Bruce Brown’s “The Endless Summer.” John Van Hamersveld was barely into his 20s when he designed it on his kitchen table while living in Dana Point and working for John Severson at Surfer Magazine. The summers are as endless as they ever were, the waves just as challenging and those who ride them just as engaged, but that iconic image of three young men and their boards is now over 50 years old. Van Hamersveld was recently inducted into the Surfing Walk of Fame in Huntington Beach, primarily but not entirely due to this illustration. In the half century since then he’s never stopped working. During the 1960s, his posters and record jackets entered every household, and very probably yours as well. 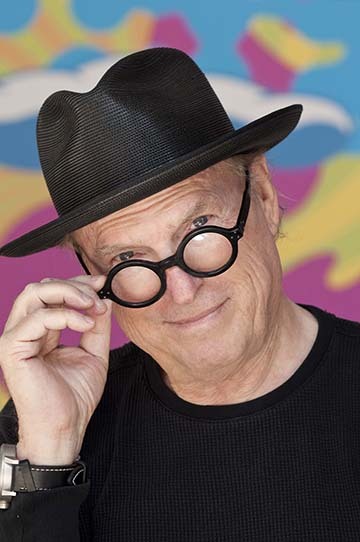 The more than 300 album covers he was responsible for include The Beatles’ “Magical Mystery Tour,” The Rolling Stones’ “Exile on Main Street,” Jefferson Airplane’s “Crown of Creation,” Grateful Dead’s “Skeletons from the Closet,” and Blue Cheer’s “Vincebus Eruptum,” the latter group, with its stacks of Marshall amps, louder than the takeoff squeal of a 747. 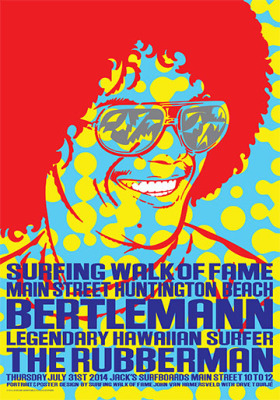 The Huntington Beach Surfing Walk of Fame has just two graphic designers, both from Palos Verdes. The second one is the late Rick Griffin. You’ve probably seen his work, too. He was a couple of years younger than Van Hamersveld, but in time both of them became good friends. If it hadn’t been for Griffin it’s possible that Van Hamersveld might never have met Severson. Without meeting Severson, Van Hamersveld might never have met Bruce Brown. If the first domino doesn’t fall, neither do the rest. The cauldron from which John Van Hamersveld’s art emerged is easily pinpointed: Lunada Bay, in Palos Verdes Estates. However, very few people are actually born on the hill. Van Hamersveld’s place of birth is Baltimore, 1941. Both of his parents were from Cleveland. His mother was a model, professional swimmer and later a plein air painter in Palos Verdes. His father was an aeronautical engineer. Unfortunately, the elder Van Hamersveld contracted polio when his son was an infant and spent three years during the early 1940s rehabilitating down in Warm Springs, Georgia. “The family thought it was an absolute tragedy that my father would have to be crippled like that,” Van Hamersveld says, although it emerges — working at Northrop and later at Lockheed — that his father was a leader with determination and a work ethic that his son inherited and maintains to this day. “Coming west was an energizing thing for all of us,” Van Hamersveld says. It was 1951 and he was nine years old. He still recalls getting off the train at Union Station in downtown L.A.. Their new home was on Chelsea Road in Lunada Bay, not far from Rocky Point. “My grandfather had bought the land and got the house built and we moved in.” Although he left the peninsula when he was 20, Van Hamersveld moved back last year. He and his wife Alida Post live in Rancho Palos Verdes. During the 1950s, Lunada Bay had miles of open fields. You could gaze up at the hills flowing down into the Estates and there were no traces of the homes that would later blanket them. There was one gulley (long since filled in) that ran from the hilltop to the sea, across from Lunada Bay Elementary School. In the deepest part of the gorge and at the base of the cliff one could glimpse the wreckage of cars. Rumor had it that irretrievable bodies were in one or two of them. And then there was the Dominator, the Greek freighter that ran aground in 1961. Van Hamersveld was 11-years-old when he met Phil Becker and Jared Eaton, soon to become two of his favorite surfing buddies. When he was 12, his parents moved him and his bed into his mother’s art studio in the back of the garage, where he had a radio and could pick up rock and roll stations in Long Beach. When it came time for high school, well, Palos Verdes had a school of fish called Marineland but not a school of or for teenagers — and so Van Hamersveld was bused to El Segundo. Why El Segundo High School, a good 10 miles away, and not South High or Torrance High? “El Segundo wanted the PV students for athletics and academic,” Van Hamersveld replies, El Segundo was a labor town, notable mostly for its refinery. Like his mother, Van Hamersveld was a good swimmer He swam at the pool in Malaga Cove near Haggerty’s, but was never a solid competitor until after a summer of surfing that built up his muscles and endurance. And although he swam for his school he didn’t like coming home on the bus late in the afternoon or evening and so he dropped out — still swimming, of course, but now on weekends and with a surfboard. Van Hamersveld’s dyslexia actually enabled him to spend more time taking art courses in high school (the unintended and sometimes fortuitous benefit that certain handicaps can produce). Having been taught drawing by his mother, his talent was already evident. He attended Harbor College for a year, got his credits in gear, moved up to Westwood, and from there attended Art Center College of Design while it was still located in downtown Los Angeles. (In the ‘70s it moved to Pasadena). When summer came, Van Hamersveld says, “My father immediately took me out to Northrop and got me a job in the publication department.” On his own time, Van Hamersveld created a surfing magazine, called it “Surfing Illustrated,” and had it printed in Hollywood Riviera (now known as Riviera Village). That was in 1962. Rick Griffin did some cartoons, LeRoy Grannis contributed photos, and ski filmmaker Warren Miller wrote a story. Local businesses were called on to advertise. Word of all this reached John Severson down the coast in Dana Point, and he wasn’t pleased. 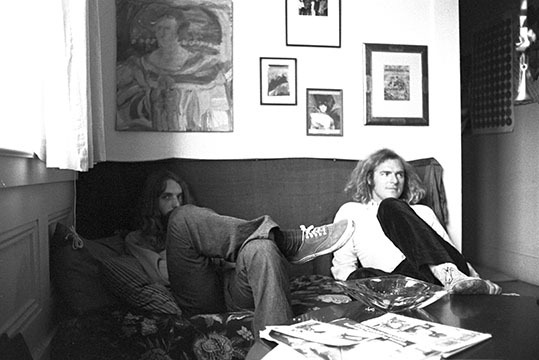 Rick Griffin came by Van Hamersveld’s house one day to convey a message. Severson himself was still in his 20s (b.1933), but being several years older certainly gave him the upper hand, or at least the perception of having it. Perhaps Van Hamersveld thought he was going to be chastised or warned. There’s a saying, and it still floats around the world of the counterculture, that if you remember the ‘60s then you weren’t there. 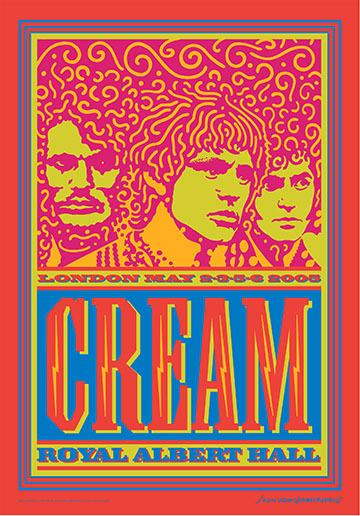 For those who came of age during that time it was a whirlwind of sound and color. But one thing to know about John Van Hamersveld is that he’s made it a point to remember and document his life. In quite a bit of detail. He’s got a couple of books in print that attest to this fact, the most recent one being a hefty volume called 50 Years of Graphic Design, and because Van Hamersveld did the layout, employing an ever-shifting range of typefaces, sizing and kerning, it’s more of a visual ride than a narrative slog. Where the publishing company, Gingko Press, did step in was with the copy. The dyslexia, let’s not forget. There were a couple of years at Chouinard, the prestigious art school, and two or three years later Van Hamersveld was hired by Brown Meggs, the Vice President of Capitol Records, possibly best remembered for signing The Beatles in 1963. During this time, from March of ‘67 to February of ‘68, Van Hamersveld designed many of the record covers still admired today. 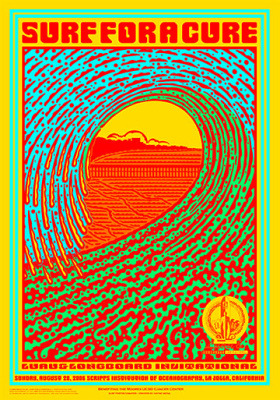 And meanwhile, with Rick Griffin up in San Francisco (an illustrator on par with the formidable talents of Stanley Mouse, Wes Wilson, Alton Kelley, and Victor Moscoso), it could be argued that Palos Verdes played a significant role in creating the psychedelic look that in large part defined the era. Van Hamersveld left the “establishment” of Capitol for the “underground” of Pinnacle, a company he was instrumental in founding, which promoted rock concerts and dances. The posters that he created for Pinnacle, including one of Jimi Hendrix, remain among Van Hamersveld’s most recognizable work. 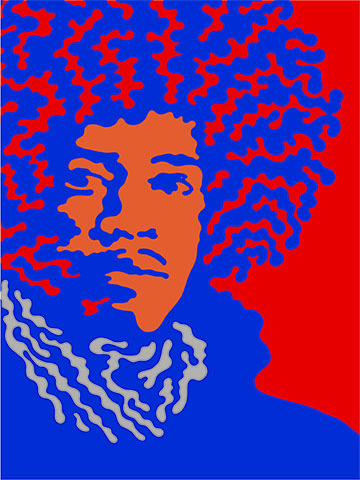 (Shepard Fairey, creator of the Barrack Obama “Hope” poster, has cited the Hendrix image as an influence on his own work). If you look down at the lower edge, to see where tickets are available, you’ll notice on many of them Either/Or Bookstore, the former landmark on Pier Avenue in Hermosa Beach. If people are asked, When did the ‘60s end? – which is to say, when did the bubble pop and the illusion turn sour, some will claim it died with the Manson victims or the Rolling Stones concert at Altamont or with the shootings at Kent State. For Van Hamersveld it had to do with the drug scene getting out of control, but also with the fact that by the early 1970s there was a pronounced commercialization by the mainstream of what had largely been an underground or alternative phenomenon. Not that this was unprecedented, not that the corporate-driven world had been absent, but the repackaging or cannibalism of one generation for consumption by the next pretty much signified that the times simply weren’t a-changin’ – they’d changed. The years passed, more of them than one might want to acknowledge, and many of the key players in Van Hamersveld’s early life have turned off their lights or gone dim. When you visit his storefront in San Pedro (in the old Williams Bookstore) you’ll see that this isn’t the case here, and so one might be tempted to ask if he can still sustain his artistic passion. Has it become more of a struggle? Well, that’s easy enough to do when you’re in your twenties. “But that’s today, too. That training.” Of course, as he points out, being a rock concert promoter temporarily put him on another time table altogether, because people associated with bands often slept in until 1 p.m. Then again, they aren’t getting home from the clubs until three or four in the morning. He pauses, and makes it clear the endless summer still has some daylight left. After that, what’s there to add? The new work — and there’s plenty of it — speaks for itself. John Van Hamersveld’s storefront, Post-Future: The Art Company, which he runs with his wife, Alida Post, is located at 443 W. Sixth St., San Pedro. Call (424) 224-7656 or go to post-future.com.